Now, it has to be said that I do have issues with this kind of competition (and with everything else of course), because the way I see it is they’re really just kind of clueless about what they think people think about Korea, and for all the polls they make at Incheon Airport they can never get a satisfactory answer. 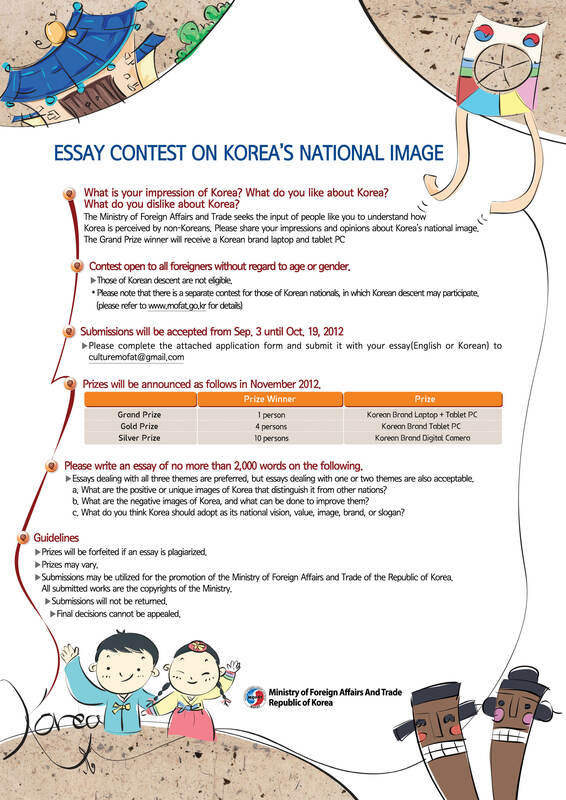 So they tried this essay competition. I never saw the winner announced or published, but I do know of one person who at least won a prize, which was a slight relief. I would like to have read the winning essay, if only to fuel (or extinguish, let’s be fairish) my cynical belief that they were looking for a specific answer, which would have doomed me from the beginning. Here it is in its untarnished form (by that I mean I’m copying it straight from the file I sent to them without reading over it and finding a thousand typos and spelling and grammar mistakes, among other faults). Enjoy. Ish. A common decoration in all royal palaces in Korea is a screen which sits behind the king’s throne. While brightly painted, it is a relatively inconspicuous and simple painting that is not too elaborate considering the weight of its position, providing relief to the most important seat in the land, the throne of the King. The painting on the screen in question includes an orange sun and a white moon, and five mountain peaks that rise and fall sharply and steeply. From these mountains flow waterfalls, and in the foreground tall trees all but complete the scene. There is one final element which is not actually part of the painting but which is still an essential component to the image; the throne and the king who sits in it. This throne and the king were situated in the centre and symbolised the harmony of the universe and also the crucial fact that the king was the central pivot of this image. Without the king situated in his throne completing the scene with the mountains and the sky, the painting showed a mere landscape, and modern Korea is very much the same as this. It has to be taken into account that during Chosun Dynasty Korea knowledge of the world beyond its borders would have been extremely limited, and it would not be unreasonable to suggest that for the vast majority of the people living then, Korea was their universe, and the King as their ruler was their representative and the symbol of their own very existence. In this respect the King not only represented the universe, but also the people, and this is of greatest consequence. Without the people who have made Korea into the country it is today, Korea would also be a landscape deprived of those who have persevered to create their own vibrant and adaptive universe that still relies on traditional relationships, not only among actual family but which even extends to strangers in the street. And for me it was these very people who appeared to be everywhere I looked the first time my airport bus drove steadily into the centre of Seoul. At first these people were only recognisable through the shape of the many tall apartment buildings which seemingly sprouted up along the banks of the Han River, like copses of trees on the verge of a larger forest. The bus’s journey deeper into that great big constant bustle of a city transformed my wide perspective to one which seemed to zoom in closer on the finer details of Seoul with every few hundred metres the bus passed. From driving through Yeouido beneath the 63 Building, crossing the Han and seeing rows and rows of more and more of the city, and as the bus looped around it somehow found its way to Jongno-ro, where I was amazed further. I still marvel at the centre of Seoul today despite living in Korea for several years. I come from a small town in Ireland of around eight thousand people where the tallest building is a church steeple. To come to Seoul and witness a building I always admired for its height dwarfed by all but the smallest of buildings, I was knew I was facing more than just engineering prowess. To achieve such a feat as modern Seoul, a society must have more than just money. It needs pride, determination, and a universal sense of community and understanding to drive them forward. What really struck me more than anything as I drove through the city on an airport bus for the first time was that I wanted to know who built everything and how could I not know about the city in front of me before? How could this human achievement be missed, and what would it take for such a spectacle of the ability of human beings ability to shine independently? I was younger back then and would soon know that I was arriving late to the story that of the Korean people and this is a story which continues today. If there is a twenty-first century comparison for all that encapsulates Korea it is Jongno-ro. From Gwangwhamun the street passes east as a busy shopping with nightlife close to Jonggak Station, and then by Insadong presenting a different more subdued style of Seoul. Both of these throb with life under the shadows of the high-rise homes of Korea’s corporate powerhouses, such as Hanwha, SK, and Samsung. This street that stretches from Gwangwhamun Plaza, watched over by the erstwhile Admiral Yi Sun Shin, to Dongdaemun Gate is only a few kilometres long, but along it you can experience more of Korea than you could in famous locations, such as Psy’s virally renowned Gangnam. There is much history on Jongno-ro, such as Tapgol Park, Korea’s first city park, and of course the internationally recognised Jongmyo Shrine. There is the lively neon lit nightlife side streets which almost every visitor to the capital aspires to photograph. Jongno-ro runs parallel to Cheongyecheon stream, another honest symbol of a new and modern Korea, yet as it moves east the buildings lose much of their glamour and wealth. Here a different Korea can be seen, an older Korea, one with roots in community. It is one which still retracts to the older ways that life was lived, seen in the crowds ever busy around places like Gwangjang Market, which in itself is a reflection of hundreds more urban markets across the country, where small businesses work together in their own street-side version of a modern day department store. This is as much a part of modern Korea as high-rise glass buildings and multi-national corporations that reside nearby. As you move down the street the city transforms in all but a few hundred metres of walking. You pass by stores selling everything from cosmetics, traditional clothes, to home lighting, hardware, picture frames, and butchers. Nor can you ignore the ubiquitous gold and jewellery shops which always heave with anxious customers considering varieties of fluorescent dazzled necklaces and rings. There is less glitz, but this is still very much Korea. Here, the tall exuberant buildings of Gwangwhamun and the teeming and vibrant streets around Jonggak Station are forgotten as you meet an older city, where people have the jackets closed tightly against their chest. Here they walk with less leisure in a bustle to get somewhere to do something. This end of the street as it comes closer and closer to Dongdaemun is a wiser and more cautious part of the city, a part of the city that has seen more of troubled past and lived through these lessons. This part of the city knows that time has passed but it continues to accept change, while still holding on tightly to the ways which established its current situation. This is not an area which is reluctant to change, it is a place where change will only come when those who populate it no longer need their past, a past suffered by so many through occupation, war, and dictatorship. To see these people is to know Korea and to understand why the Korean people, with their undying spirit of national community, have built one of the strongest and wealthiest economies from the scraps of destitution and bloodshed. But to suggest that the Korean people are the most unique aspect of the country is pretty much a given. Is it worth reducing to second place all the other magical and unique characteristics that make up Korea? There is the food (which I love), the music – from K Pop to pansori, and all the culture and traditions which families and individuals have built their lives around, but all that I try to compare with the hope of recognising something more noteworthy or more exceptional, it always comes back to the people who developed these cultural and national attributes over the years. You could also argue that the people are crafted by the landscape and environments they live in, and that these would supersede the importance the people creating their own unique identity. Although this is a reasonable assertion, when you look at the history of Korea the only geographical feature which truly influenced Korea was its position as a peninsula protruding into the sea between China and Japan, a fate which was instrumental in the establishment in Korean’s resilience and modern determination to excel above its self perceived lot. There is no doubt that Korea’s geographical position has both threatened and benefitted its existence over the years. However, as the foreign influence was so slight up until the twentieth century, I contend that it is the doggedness of the people which elevated Korea to its current status and earned the respect across the world in every conceivable area of thought and action. The determination and resilience of the people is continuously apparent as Korea’s name appears on lists with the worlds finest. In the recent Olympics in London, Korea was placed fifth in the medal rankings ahead of countries such as Germany, France, Australia, and Japan. The Olympic Soccer team recaptured the spirit of the World Cup in 2002 with an epic adventure into the semi-finals of the competition, followed by a clash with old rivals Japan. While on the subject of sport, let’s not forget the fine individual efforts of Kim Yu Na at the Winter Olympics in Vancouver, and the exciting prospect of Korea hosting this event in 2018. Korean’s success has extended beyond sports, from politics to business to technology, Korea’s influence has spread across the world, and always guided at the helm by people who recognise the national thirst for excellence reaches beyond the borders of the country. For all that is celebrated about Korea; none would exist without the will of the people, because it is the people who we remember more than anything when we leave Korea. Both the new Korea, one which is modern and wired with Smartphone’s and the latest Italian fashions, and the old, one where old traditions based around ancestors and lunar patterns still resonate strongly, coexist together. You can see it when you step off the bus in any part of a city or country town, and you can see it when people meet and greet each other in different situations, be it with family, friends, or co-workers. Korea’s people are always aware that it is they who determine their nation’s status, and it is they who determine their future. They know that they have been born on this planet to live together in harmony for the continued prosperity, and they fight tenaciously to do this. Through my years living and working in Korea, it is this determination and sense of purpose which I have witnessed to be what Korea really stands for; these are what make Korea the land of the Koreans. It is here where you can witness so many characteristics which when they are combined together can only be truly described as Korean. You see the magnificence of aged palaces, the glitz and wealth of the many cities, the countryside tended to diligently year after year, and success after success on the international stage. These standards are so common that you cannot miss them. They are the traits of a nation, and it is a nation which is proud to blatantly display and espouse its characteristics like a trophy.